Note: Forgive me for not being here! I’m currently away in Madeira with my family but I’m getting a lot of reading in and here’s my review for the first book I’ve finished since I arrived. Unfortunately I don’t have my laptop with me, so forgive this review for being a little all over the place! I’ll edit it properly once I’m back off my phone. I’ll be back home on Saturday, but for now I’ll just be posting reviews of books I’m finishing. Other posts would be too hard without my laptop! I think the easiest way to describe this book is unique. It’s possibly the most unique YA book I’ve ever read. This book made me reconsider the boundaries of YA itself. It pushed everything I know about YA aside and created something entirely new and wonderful. I won’t lie – I found this book a little mixed up. The narrative is some of the strangest I’ve come across. 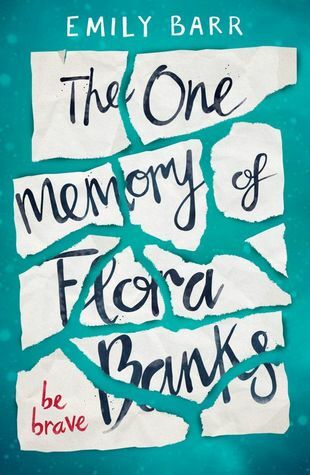 Due to Flora’s amnesia, a lot of the book is deeply repetitive (especially in the first ~100 pages). This kind of annoyed me a little for a while, but I did get used to it and understand how it was vital to the story. I obviously can’t speak for the accuracy of how Flora’s illness was portrayed, but I have to say it felt real. The complex plot really reflected the wild randomness of Flora’s mind, and I really admire Barr for being able to create that. The main thing I loved about this book is it’s complexity and cleverness. I won’t say I didn’t see the plot twists coming – I did guess some – but I also enjoyed the discovery. However, there were parts of this book I didn’t enjoy. Specifically, Flora’s narrative. Yes, the repetitiveness of her story is vital. It is also incredibly, incredibly tedious. I found her incredibly childish at times and found the writing suitable for middle-grade. Therefore, the “emails” seemed very out-of-place and weird compared to the narrative. So overall, I didn’t love or hate this book. It was intriguing, involving and I found myself completely absorbed in the story from after around 100 pages. I liked the setting(s), numerous characters and complex plot. I wouldn’t recommend it to everyone, but it’s certainly very intriguing and I’d still say give it a go if you like the sound of the synopsis! Ugh, I also couldn’t stand Flora’s narration. It made me feel uncomfortable because I could easily see her being taken advantage of (I haven’t finished the book yet, so I don’t know if that actually happens). I get that it’s important to the plot, but it just…kind of felt squicky to me. I probably need to just get through all of it, though. Dawlyn: Glad you enjoyed this! I’d like to read it at some point in the future!